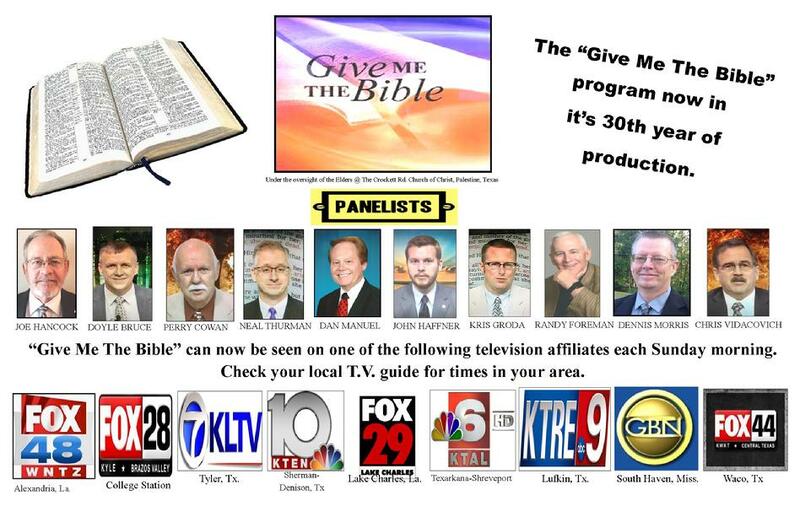 The Give Me The Bible Television Program is now available for viewing. You can watch the Give Me The Bible Broadcasts by clicking on the title of each broadcast.
" Some Things You Will Never Regret "
" The Lazy Man "
" Is Church Attendance Really Necessary? " " I Must Be About My Father's Business "
" Powerpoints Of Prayer "
" Extreme Home Makeover "
" Why Is It Necessary To Be Baptized? " " How Can I Lose My Soul? " "Why Does The Church Exist?" "Some Things That Made Adam & Eve Happy"
"Am I Indebted To Christ?" "What Sin Steals From The Believer"
"The Truth Must Be Handled In The Right Way"
"To Confess Or Not To Confess Sin"
"Gideon Learned To Trust God"
" Seven Steps Of Newness "
"Six Steps To Greater Faith"
" The Truth About Baptism "
" I Am Indebted To Christ "
" The Plea Of Christ's People "
" Living Life Enthusiastically "
" Are We Suffering From Bible Illiteracy? " " A Blind Man Receives His Sight "
"Do We Love The Lord Enough?" " Go Tell Somebody "
"What Must Be Right About The Church?" "Broken But Not Beyond Repair"
"Righteousness, Self Control & The Judgment"
"Behold The Chastening Of God"
"Behold I Stand At The Door"
"The Plea of the Church of Christ"
"How To Get Along With Other People"
"Can We Really Have Blessed Assurance?" "The Church That Jesus Built"
"The State of Your Soul"
"How To Handle The Truth"
"God Tells Us To Be Joyful"
"The Second Coming Of Christ"
"Am I Willing To 'GO' For The Lord?" "Can Faith Alone Save Us?" " Is Gambling A Forbidden Chance?" "How To Have Blessed Assurance"
"Repentence: What Is It & Why Is It Important?" "What Am I To Confess"
"The Nails of the Cross"
"The Man God Called A Fool"
"The Christian's Life - God's Marathon"
"Does God Favor Some Over Others?" "God Tells Us To Trust & Obey"
"Casting Away Our Garments of Sin"
"Proclaiming The New Testament Gospel"
"Are You A Good Listener?" "God Is No Respecter of Persons"
"Can A Person Be Taught Wrong & Baptized Right?" " Renewing Our Faith "
"What Should Happen When We Go To Worship?" " Are You A Good Listener? " " How Do You Handle Bad News? " "Voting in the 2016 Election"
" Between the Birth and the Resurrection "
" The Presence of the Lord "
" A Joyful People 2 "
" We Have So Much In Christ "
" Resolutions For A New Year 2015 "
"Do We Reap What We Sow In Life?" " We Are The Church of the Way We Are Were "
"The Local Church, It's Autonomy"
"The Ingredients for a Strong Church"
"Things You Should Never Do"
" Made For Ministry "
"The Significance Of Being A Christian"
" The Paradoxes of Christianity "
"What Membership In The Church Means"